It’s no secret that BOOM! Studios’ KaBOOM! imprint is home to some of the best “all-ages” comics published today: Bee and Puppycat, Abigail and the Snowman, Mega Princess, and so many more. And now, add The Not-So Secret Society to that list. 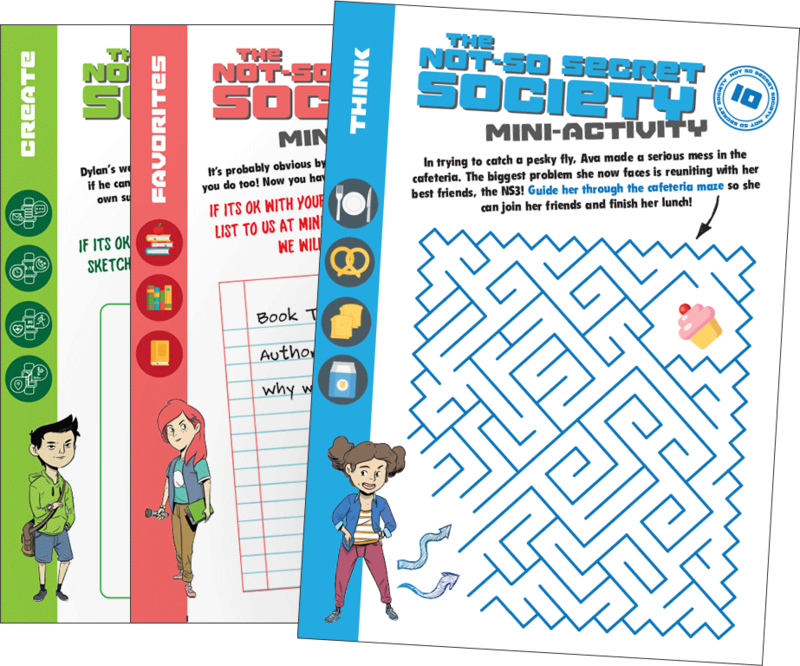 The Not-So Secret Society will be released on July 26 in comic shops and August 1 everywhere else. Until then, here’s an exclusive peek at the book, along with commentary from Matthew Daley, Arlene Daley, and Wook Jin Clark. Matt Daley and Arlene Daley: Although the opening teaser is set in a subway station, the beginning of this chapter was a real opportunity to establish that these kids live in a city, which was essential to us from the beginning. Wook Jin added some great touches here, like in panel 1, the kids are exiting a city bus and not a school bus. Yellow school buses aren’t an everyday thing for kids in the city. And of course, the cityscape in panel 2. It’s set in the background, and the foreground is a park. The NS3 have the best of both worlds: nature and a city. Wook Jin Clark: The state fair was always a highlight of my childhood. Thinking about that kind of stuff made this scene where we get a glimpse of the Halloween extravaganza that much more special. I know it’s more grandiose toward the end of the book but to me, it’s always fun to see the setup and breakdown, kind of a behind-the-curtain thing. Plus, I can’t even imagine what it’d be like if there was a giant block party in my neighborhood. As a kid, if this happened I would probably never do my homework, so good on the NS3 for being able to still do their project because I know I wouldn’t be able to concentrate! Matt & Arlene: As writers – especially for those like us that cannot draw – you really need to trust your artist, which is why we are so lucky to work with Wook Jin. Panel 3 was scripted to display a struggle between an angry Ava, a Madison that is trying to maintain peace, and a nonchalant Dylan. Wook Jin added Ava’s “ghost” arm to show how angry she is at Dylan’s comment from Panel 2, Madison is sweating it out and clearly has her hands full, and Dylan looks at his watch as if nothing is wrong. These gestures also exemplify their characters. That’s the beauty of sequential storytelling. There are so many opportunities to show who the characters are. Wook Jin: Matt and Arlene’s writing on this page made me laugh since I know I would definitely bicker with my friends like Ava and Dylan do! Matt & Arlene: Who isn’t a sucker for a great montage sequence?! It’s quite possible that we added a few more throughout the book because we love them so much, but this is the first. The first four panels work so well because Wook Jin establishes a great rhythm, escalating the tension for Aidan both through his slightly changing facial expression and the amount of sweat on his face. The other members of the group are acting quite normally and expressing what’s important to them, which again builds character. Not sure if this montage will enter the pantheon like The Godfather or Rocky IV, but our fingers are crossed. Wook Jin: Haha, I wish I had the ability as a kid to build stuff like the NS3! It would have probably been a bad idea and I’d probably get into just as much trouble as them. I wish I was their friend just so I could propose ideas for things to make! Artwise, I wanted to get that same excitement and enthusiasm across as if I was in the room with them and got to experience this stuff first hand! Matt & Arlene: We certainly didn’t make things easy for Wook Jin. The machine they invent, the C-Rex, had to look cool enough for readers to pay attention to it but also look like something that kids might be able to build. In other words, it couldn’t be too advanced and look like it was born out of a lab at Apple. It also had to look like something readers had never seen before. It was a tall order and Wook Jin nailed it. Wook Jin: Matt and Arlene wrote stuff that was so easy for me to visualize and draw but also to empathize with. I definitely think they captured the feeling and vibe that kids would have around each other at that age. The initial excitement to disappointment to joy again is a thing I think most of us forget about when we are kids, and they captured that feeling very well! Matt & Arlene: Within the world of the NS3, we created new candy and food brands. Meaning, the kids don’t have Jawbreaker candies; they have Rattlers. There are no Hershey Kisses; instead, they have Twinkles. The big reveal is, of course, the Bear Hug brand of gummy bear that we meet on the next page. But on this page, we love how Wook interpreted the Twinkles. It looks too cute to eat . . . and hideous once it’s melted. Which is true for most candies. Side note: The shape of the Twinkle makes a lot more sense than the shape of Kisses. Just saying. Matt & Arlene: The C-Rex has failed twice and there’s no reason to believe that it will work the third time. What makes this page work so well is how Wook Jin varied the shapes of the panels. The previous two pages – the set-up – utilized more traditional panel shapes, while this page – the payoff – moves things in a new direction. Readers – especially young readers – will pick up on the fact that something different is now happening. The triangular shape of panel 2, with the splash effects at its base, open to panel 5, allowing for the first success that the characters experience in the book. It might seem subtle, but when the art works this well, you don’t need the speech bubbles to convey the story. Wook Jin: With Gummy, I drew inspiration from my favorite brand, which is Haribo! I think I’d feel perplexed if I had Gummy around because I’d constantly want to eat him! I love gummy bears!